HERE THEY COME! 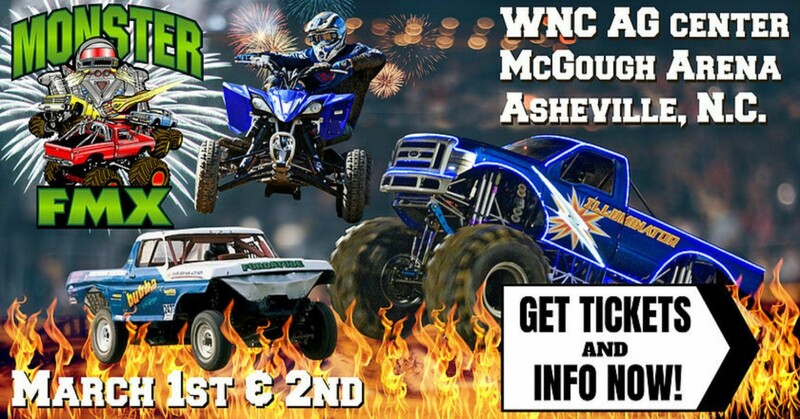 MEGA-POWERED MONSTER TRUCKS, PRO FMX FREESTYLE MOTOCROSS JUMPERS, SMASH AND CRASH 4X4 TOUGH TRUCKS AND MORE! MONSTER TRUCKS...SEE 10,000 POUND MEGA-POWERED MONSTER JAM GIANTS BATTLE IN WHEELIE, SIDE X SIDE RACING AND OUTRAGEOUS FREESTYLE COMPETITION. SEE THE MONSTER VW BUS CALLED "FLUFFY" BATTLE "INSTIGATOR", "GENERAL HAZARD", "ELIMINATOR", "BALLISTIC" AND MORE METALLIC MONSTERS! TUFF TRUCKS...HERE THEY COME! SMASH AND CRASH 4X4 TUFF TRUCKS! IT'S A 4X4 WAR ON THE FLOOR WHEN OUTRAGEOUS AND DANGEROUS TUFF TRUCKS BATTLE OBSTACLE COURSE BUMPS, JUMPS AND HAIR PIN TURNS! ONLY ONE WILL DRIVE AWAY WITH THE "TOUGHEST TRUCK" TITLE! MONSTER TRUCK RIDE TRUCK...TAKE A RIDE ON THE WILD SIDE IN A REAL 10,000 POUND 12' HIGH MONSTER TRUCK!